Top row (left to right): 1. Deanna ?, 2. Maia Khan, 3. Brenda Tatjees, 4. Beverly Chrisman, 5. unidentified, 6. Suzanne Bohrer, 7. Thomas Wood, 8. unidentified, 9. Dennis Gee. Second row: 1. Kathy Zurakowski, 2. Donald Hole, 3. Laura Cassell, 4. Richard Wasley, 5. Shannon White, 6. Mark Veca, 7. Anne Fernberg, 8. Andrew West, 9. Colleen Pence. Third row: 1. John Mihoevich, 2. unidentified, 3. unidentified, 4. Cynthia ?, 5. Michelle Yano, 6. Jeff Norris, 7. Donna ?, 8. Nancy ?, 9. Cindy Robinson. Fourth row: 1. Mrs. L. Henning, 2. Wylie Fabyan, 3. no picture, 4. no picture, 5. no picture, 6. no picture, 7. no picture, 8. Terry Urinack, 9. Mr Donald Larsen. Credits: From the collection of Laura Cassell. 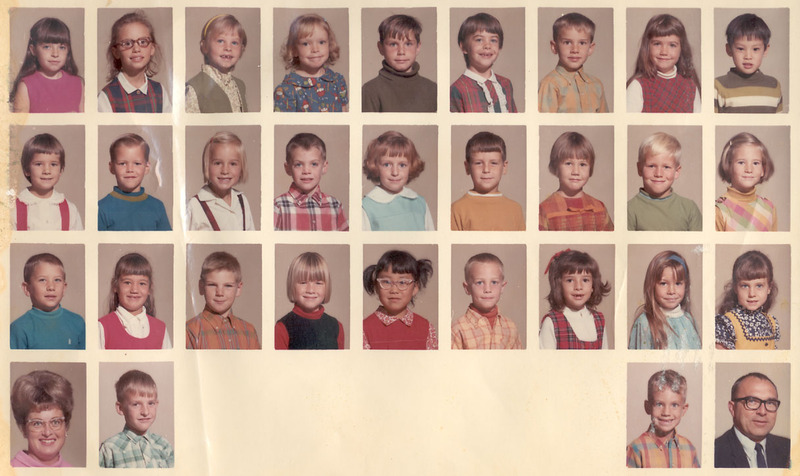 Thanks to Laura Cassell, Jeff Makaiwi, and Mark Veca for identifying the kids in the picture.